Friends of the Northern Rail Trail have undertaken to make repairs on several bridges in Andover and Danbury. This photo shows the completed repairs on the left side of one of the bridges and the existing condition of the right side. Board Attendees: George Heaton, Craig Heim, Lindy Heim, Chris Norris, Jack Shields, NitaTomaszewski. Loyal Trail Supporters: Ricker Miller, Patrice Rasche, Steve Rasche. With Business Matters in good order, the meeting focused on discussion of the needs of the Trail in the future, and the hope for its expansion into Boscawen. These issues will be pursued more fully at the next meeting, in January. 1. Minutes of September and October, 2018 Board Meetings, accepted unanimously without amendment. Chris Norris and Ricker Miller reported that excellent repair/restoration work has been completed by our frequent contractor Rodney Judkins at three of the six bridges in need. The remaining three – two in Andover and one in Danbury – will, we hope, proceed as planned, in spite of early snow and cold. Ditching work has presented new challenges at Agony Hill and near Eagle Pond, with significant runoff and clogged culverts. Ricker Miller and John Champagne hope to remedy these issues soon. A discussion of mowing and Trail clearance, led by Ricker Miller, opened the issue of long-term vegetation incursions and the need for an improved strategy. Certain areas of the Trail have seen significant overgrowth — almost resembling a “canopy” — and the sides of the Trail have been reduced. The needs and means of keeping the Trail clean and open, long-term, will again be taken up at the next meeting, with consideration of long-term budgetary needs. Jack Shields led a discussion of the current situation with respect to an extension of the Rail Trail to a new terminus at the Hannah Dustin site in Boscawen. Jack has been deeply involved in this issue for some time, and is the FNRT-MC “point person” in this regard. Most importantly, the Town of Boscawen has submitted an application for a TAP (Transportation Alternatives Program) grant from NHDOT of $463,000, to acquire right-of-way and create a Trail and amenities. A decision on this application is due in January. If awarded, it would require an 80-20 % matching formula between State and other funds. Meanwhile, the overall situation is complicated by the unfolding actions of other parties: the position of the PanAm Corporation, who holds the right-of-way; New Hampshire State priorities, which may emphasize other projects along the Seacoast; the plans of the City of Concord and private developers in Concord; and perhaps even legislative attention in the new session. Given this situation, it is clear that FNRT-MC needs to consider how it can best support the proposed extension of the Trail. The extent to which this involves commitment of funds, fundraising, advocacy and other actions needs to be carefully considered. These will be major topics of discussion at the January meeting. A budget for the Year 2019 will be offered by the Treasurer and discussed for approval. As we are well aware that decisions about maintenance plans and the Trail extension to Boscawen could have major budgetary implications, the discussion of all three issues will dovetail. 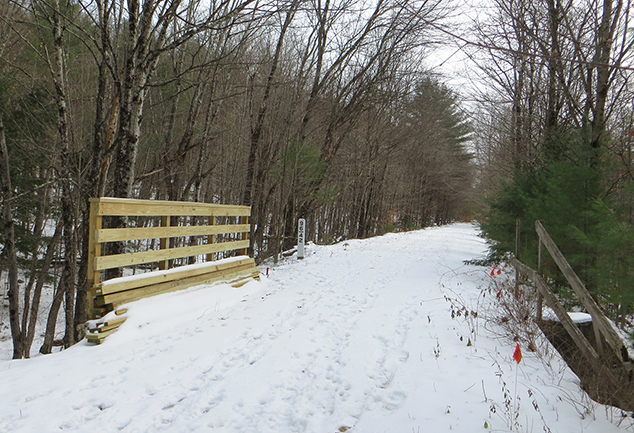 Chris Norris will consider the maintenance budget for the foreseeable future, and Jack Shields will continue to gather information on the Boscawen Trail extension as input. Wednesday, January 16, 7 PM, The Hub, Andover. All are cordially invited to this important discussion.